I guess it was bound to happen. Someone got hurt in the gym yesterday - and no, it wasn't me. We were finishing our hour of Spin and a woman ran up from the back of the class to Andy the instructor and said something in a frantic voice. Andy jumped off his bike and hurried back to the room, and even though the place is entirely mirrored, I couldn't quite see the issue. Partially because other had gotten off their bikes, partially because we ride with minimal amount of lighting. It was also a completely full class, so my line of sight wasn't the best. I started to get off my bike to see if I could help, but I already saw two people around the woman who could assist better - one a doctor and one a nurse practitioner. Another class member had gone downstairs to alert a full-time staff member. The woman wasn't passed out or in coronary distress or anything like that, she clearly did something to her foot, ankle or leg - while Spinning. The best I could come up with is that if she was wearing clips (and I am not sure she was) and they became disengaged during our heavy resistance ride. Or if she were strapped in, that her foot slipped out and somehow twisted. The thing was, during this time, we were sitting, not standing and I just don't know how she did it. Maybe she re-injured an existing malady. Either way, they had to carry her out of the room and into the hallway. My favourite thing about the entire event, an older Spin instructor came rushing into the room to see if he could assist.....................with our cool down. LOLLLLLLLLLL. Yes, Andy was busy helping his student, but not only was our cool down the least important thing going, we had also pretty much done our own anyway - not that anyone was focused on that. I hit the showers afterwards and when I dressed and was exiting the locker room, I almost ran into Andy. I mock pleaded with him "don't hurt me" - insinuating that his tough class had injured the lady. He at least laughed. I mean, it could have gone either way. 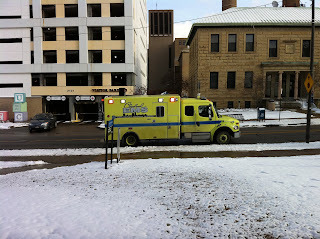 After Andy passed, I saw the stretcher. 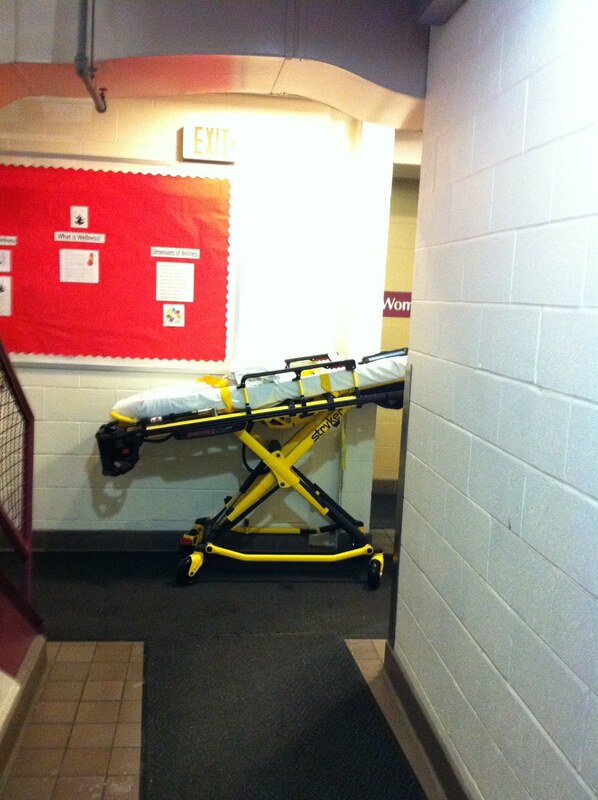 At some point EMS was called and they were upstairs working on her. I'm sure getting her down the stairs wasn't going to be easy - for any of them. 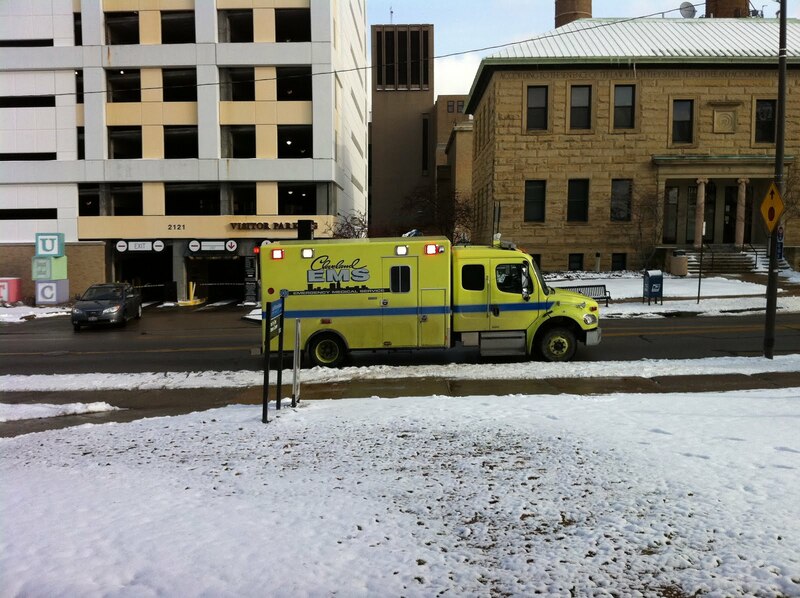 I did go outside to my car where I saw the EMS vehicle you see in the title image. I do hope she's alright though. And speaking of injury - I don't have one from my personal training sessions. Mostly because they haven't begun. My trainer has not returned from his surgery. So far he's a week and a half later than expected. I hope his procedure didn't go awry. At some point I'll need him, though as of today, no financial transactions have taken place, so in that respect I'm good. But I do expect to be gym-injured in the near future. No EMS is to be required. Hopefully. 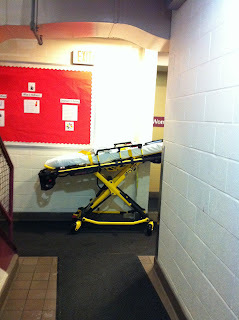 At our gym, there seems to be at least one injury, fall, or EMS call per week. It has always been on my mind about injuries and heart attacks and all of that. But, I have yet to see an ambulance at the gym. Fingers crossed! Don't even say that out loud! With all that weights swinging around and all of the folks who don't know what they're doing, i'm surprised there aren't more injuries at the gym. Now you've got me spooked...so i won't be working out tomorrow!